With their season going, well, nowhere, the New York Yankees are likely to break up their ultra successful bullpen trio, with Aroldis Chapman as the most likely player to be traded. If he’ll indeed be on the trading block, the Boston Red Sox, Chicago Cubs, Los Angeles Dodgers, Washington Nationals and Texas Rangers are likely to be interested. Chapman is a free agent at the end of the season. The Yankees traded for him from the Cincinnati Reds knowing that he’ll be suspended for the beginning of the season. He’s done very well for the Yankees, despite a 3.15 ERA, almost double his number from last season. He has saved 15 of 16 games, his WHIP has improved to 1.000 and while his strikeout ratio is slightly down (14 per 9 innings), he has done an impressive job of avoiding walking players, with a 7.75 strikeout-per-walk ratio, the best of his career so far. 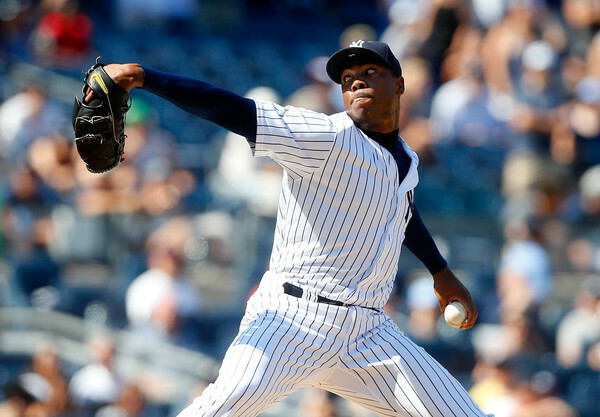 Chapman is making $11.3 million this season, a bit more expensive than Andrew Miller. However, Miller is on the hook for two more seasons, making $9 million in each. The Yankees might also be asking for more in order to get him, but might be a bit more reluctant to move him. Chapman is likely to ask for a lot of money once his contract is up, and while the Yankees have one good thing going for them this season, their bullpen trio, moving Chapman will be easier. Of the teams interested, the Red Sox aren’t going to get him. It’s hard to believe the Yankees will deal him to a division rival, let alone to Boston. The Dodgers might be very happy with the closer they have now, but they do need a lot more help in their bullpen, as this team has been struggling in games Clayton Kershaw doesn’t appear in. The Nationals have the return of Jonathan Papelbon coming up soon, so adding to the bullpen could be necessary if he doesn’t come back as strongly as they hope for. The Rangers obviously need help in that area despite their excellent season, with the Cubs in a similar situation: An excellent season, but holes are beginning to show in what looked like a historic season. As for Miller, it’s hard to believe the same teams and more won’t be interested in him. He actually has a 5-0 record this season with a 1.34 ERA. He’s striking out 16.8 batters per nine innings and has a 21.00 strikeout-to-walk ratio, while posting an 0.624 WHIP. He might not be a closer, but a struggling Yankees team will have to think about it at least, even if he is the best relief pitcher in Baseball at the moment.